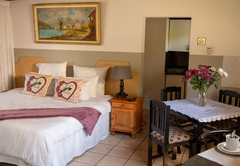 Lincoln Cottages is a highly recommended B&B with self catering option, providing accommodation in Pietermaritzburg for tourists visiting the Natal Midlands region. 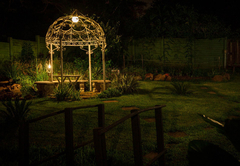 Pietermaritzburg is the hub of the Natal Midlands, and is the Capital of KwaZulu Natal. The City therefore plays a leading role in the economy of the region. 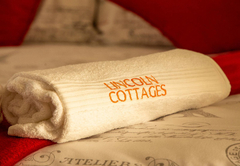 Lincoln Cottages spans more than three quarters of an acre and comprises of four fully self-catering cottages which are able to sleep up to 16 guests. 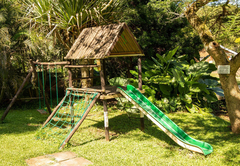 Our establishment is child friendly and equipped with jungle gym in the gardens. 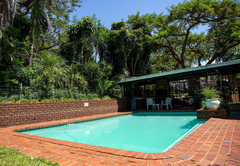 We have a communal swimming pool and braai area. 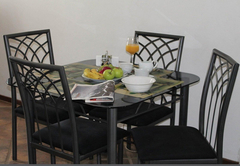 All cottages have DStv, offer tea and coffee facilities and are serviced on a daily basis. 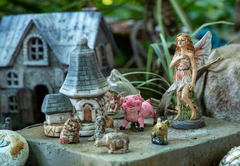 This lovely quaint cottage is home away from home. 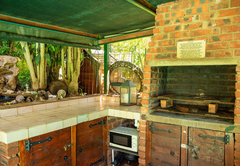 The cottage has one room and open plan lounge and seperate kitchen, and is complete with quarry tiled shower. 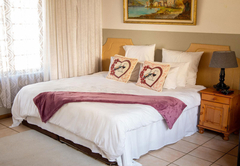 The main bedroom has a queen size bed and two single beds in the lounge area. The kitchen is fully fitted. This cottage sleeps two people and has an en-suite shower. The kitchen is fully fitted. 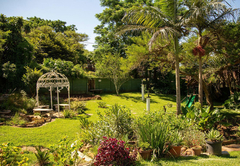 The unique feature of this cottage is the outside patio that has the best views of the gardens, and faces the communal braai area and entertainment centre. This apartment is attached to the main house. 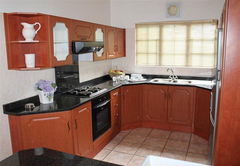 It is tastefully decorated and comprises a main bedroom and an open plan kitchen / lounge. It sleeps four people and has a baby room with sleeper couch that sleeps two children. 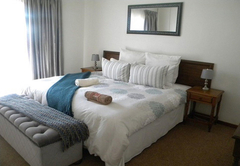 This modern finish cottage is the largest of all our self-catering cottages. This Chateau can sleep up to 6 people. 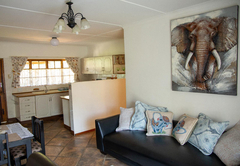 It has two rooms and open plan lounge and kitchen. The kitchen boasts fully fitted cherry wood cupboards with granite tops, complete with a hob and oven as well as a breakfast nook. 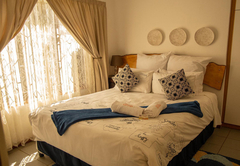 The main bedroom has a King size bed and two single beds in the second bedroom as well as a double sleeper in the lounge area. The bathroom hosts both a shower and a bath. 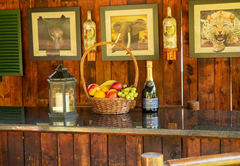 The Cabernet Cottage is just as the name describes…smooth on the eye and exquisite on taste. 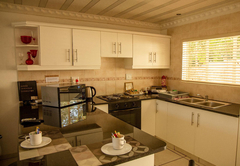 This cottage is fully self-catering and boasts a stylish black and white fully fitted granite topped kitchen. The hob with oven is a dream for any cooking enthusiast.The down lights in the kitchen provide a homely ambiance that compliments the style of this modern kitchen. The open plan kitchen leads onto the bedroom which can sleep up to three people, with a queen size bed and plenty of room for an additional single bed. A tempo ceiling fan for relief on those hot days adorns the stylish ornate moulded ceiling. 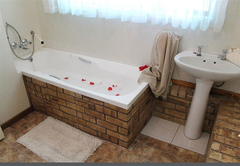 The classy bathroom has a shower over the bath tub – to suit the taste of your preference. 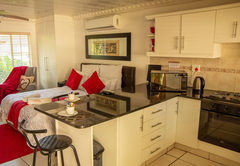 This classy modern day jewel of accommodation gives a new definition to the word cottage. 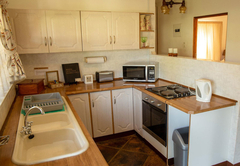 The Merlot is fully self-catering and boasts a black and white fully fitted kitchen with stove and granite tops. 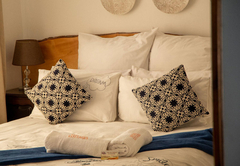 The elegantly Egyptian styled bedroom sleeps two people on a king size bed complemented with en suite bathroom (modern shower). 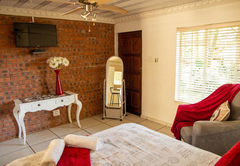 The bedroom has a tempo ceiling fan which adorns the very ornate moulded ceiling…and this adds to the finishing touches of this modern cottage. 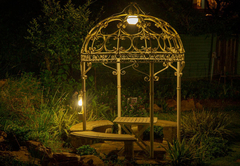 The cottages are situated near a flowing brook which creates a feeling of relaxation and serenity. 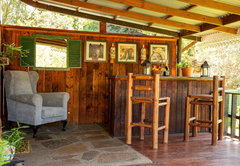 When combined - the Cabernet & Merlot cottage can be let out as a spacious family unit via inter leading access which then can sleep 5 persons. 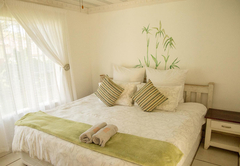 This cottage sleeps six guests in two bedrooms and has an bathroom with a bath and a shower. The cottage has tea / coffee making facilities. 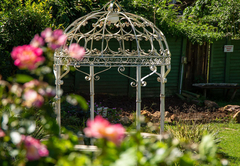 We are fully self-catering, however full English breakfast is also offered as well as other meals to order. 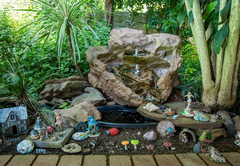 Pets are allowed on conditions they are small and are house trained. 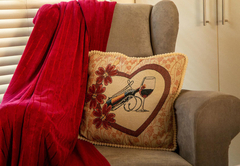 Owners must bring their own pet baskets and pets are not allowed to sleep on beds or sofas. 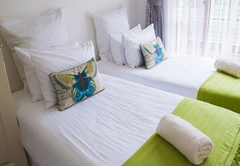 Reception must be notified of the type of pet to be accommodated on confirming the booking. Smoking is not allowed inside the cottages. 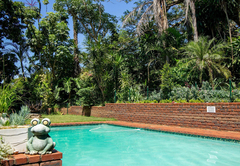 We are only 40 minutes away from the Indian Ocean and the entertainment hub of Durban, 35 minutes away from the majestic Drakensberg Mountains and on the doorstep of the cultural Midlands Meander. 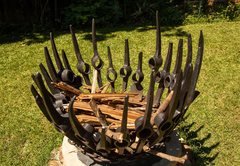 The Durban ( King Shaka) International Airport is just over one hour drive from us. 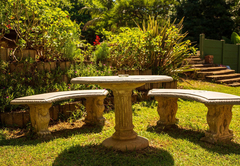 We are 10 minutes away from Pietermaritzburg’s Oribi Airport. 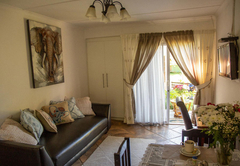 We are situated close to the N3 and only minutes away from all local attractions such as the Liberty Mall, the Golden Horse Casino, and many renowned schools and sporting venues. One large room with twin beds & sleeper couch. 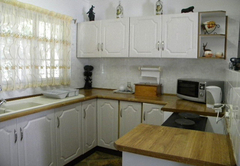 Kitchen is also located within the room, fully equipped, granite work tops. Separate wash up facilities & en-suite shower. 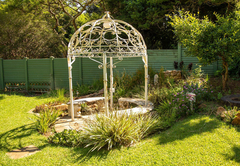 Covered outside patio that has the best views of the garden & communal braai area. 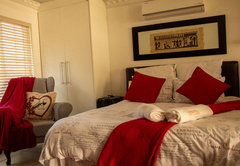 It is tastefully decorated & comprises main bedroom with queen size bed, an open plan kitchen/lounge area with twin beds. This apartment is attached to the main house. 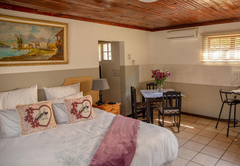 A stunning fully self catering cottage which comprises of a king size bed and a single.It is open plan with an ensuite bathroom. Fully fitted kitchen. Modern finishes, super cosy. I was really surprised. Will definitely recommend and will gladly stay again. Response timeLincoln Cottages typically responds to requests in 5-10 minutes.